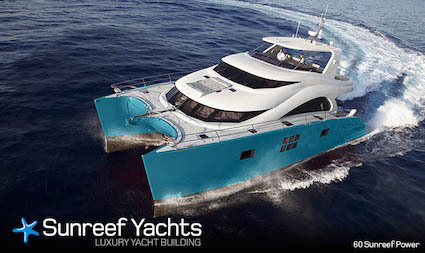 The company, once again, proved that it is the undisputed leader in construction of custom and semi – custom catamarans and superyachts. Upon the client`s request Sunreef`s interior design team prepared a “tailor made” project with open salon combined with lounge area and bar instead of interior navigation station where some additional storage, small fridge and ice maker were fitted, so that there is an easier access to refreshments for guests, as the galley in down in the aft of the portside hull. The interior decor is made of the highest quality materials, the furniture and walls are in white lacquer with oak elements, as well as white upholstery. All arranged in marine style with a touch of indigo, noble blue and deep red colors. The interior layout configuration is adapted for 8 guests (+2 kids) with a master cabin and portside guest cabin that has double beds and small kids bed/sofas, as well as the starboard hull with two cabins, the aft one with a double bed and the middle one with a single bed and bunk beds. There is also a TV lounge next to the entrance to the master cabin. The yacht has all the facilities that will provide comfort for its guests. The crew quarters are separated from the guests and are in the starboard forepeak with a bunk bed and its bathroom. 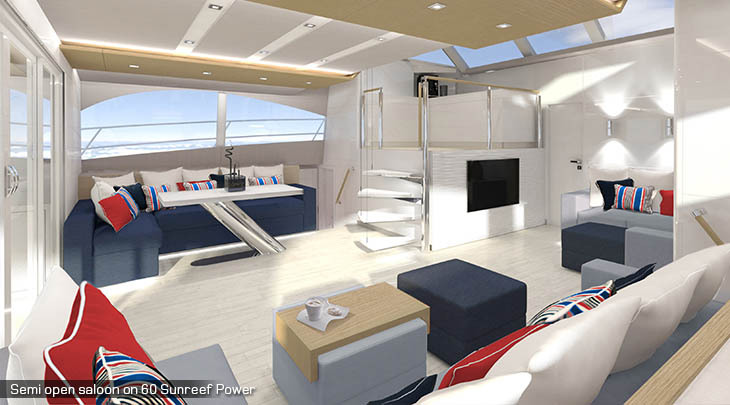 The concept of 60 Sunreef Power was made in response to the growing demand for compact yet highly impressive powerboats. This yacht has all the features of the popular 70 Sunreef Power, except its slightly smaller 27.8 ft / 8.5 m beam that makes it more convenient for crowded marinas. The aim of 60 Sunreef Power line was to be one of the most successful models in upcoming years and this goal has certainly been achieved.